It had to happen sometime. Someone had to make a Golden Axe movie. Where else can you find such high drama, romance, adventure, and serious blood-letting? Death Adder's Castle has become the exclusive home to the pre-release teaser trailer for "Revenge of Death Adder: The Movie." So kick back, wait for the complete download, and be one of the first to see the trailer that will hopefully set new attendance records in theatres, though it was supposed to have come out in the summer of 2004 (which apparently has been delayed for some unknown reason). For actual movies of game play, go here. 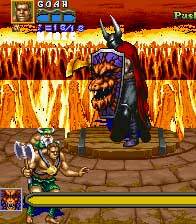 Check out this awesome Golden Axe music by Blades of Vengeance! See the current "teaser" trailer by clicking this link. Keep in mind, this is a big file that will strain your internet's downloading abilities... but what else were you going to do today? (If the pictures seems kind of jumpy as you watch, wait until it finishes loading, then hit refresh to watch it again.) Enough yapping, download it here. To see the very first teaser trailer, click this link. The one above is much better, in my opinion, but they had to start somewhere. Great Flash movie of our Ax Battler in action -- and even a guest appearance by Death Adder. I've started redoing some of the Golden Axe music with better instrumentation (and a little artistic license). I hope to finish by putting together a musical representation of the entire game, using nothing but the themes from the game itself. I'm including the only section I feel is finished at this point, which is the music for Death Adder.